All ages and at all times. Office workers with busy, hectic lifestyles. New mothers-to-be who require prenatal nourishment. Recovering patients with poor appetite or weakness of the body. Growing children and adolescents who fall tired and sick easily. Seniors who are weak and with poor digestion. Essence of Chicken is formulated from quality chicken. It is rich in protein and amino acids. It helps in replenishing Qi and blood, and is therefore excellent for revitalizing tired bodies and minds, improving metabolism. 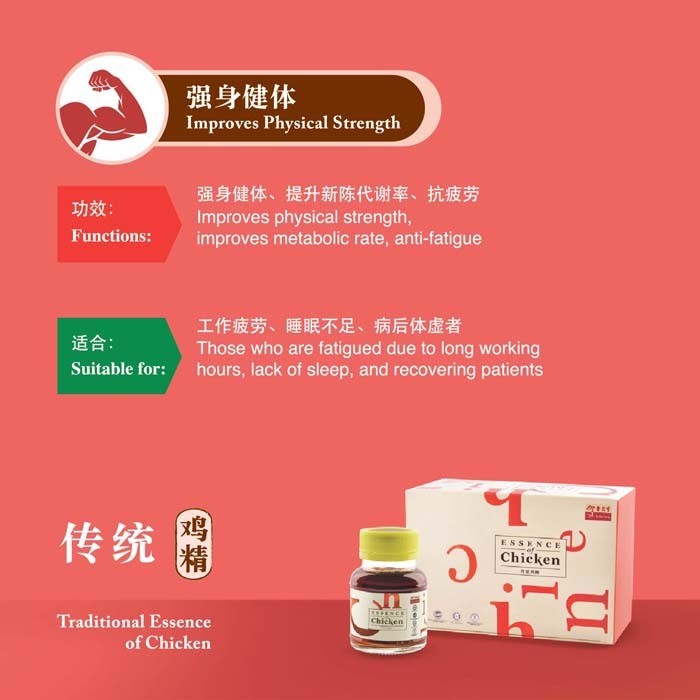 Whether you are preparing for that important meeting or studying for your examinations, Essence of Chicken has been a popular choice consumed by generations to improve alertness and mental concentration. Made from premium graded chicken, only Eu Yan Sang gives you 100% pure Essence of Chicken with no caramel added. It is suitable for consumption by all ages and at all times, and can be taken chilled or warmed everyday. Adults- 1 bottle each time. Children 4 to 12 years- 1/2 bottle each time. Eu Yan Sang Essence of Chicken in Malaysia does not contain caramel colouring. Caramel colouring has shown a positive association with risk of hypertension or high blood pressure! In TCM, stress affects the flow of Qi and impedes the delicate balance in our body.